Xi Jinping is widely viewed as the strongest leader China has had since Deng Xiaoping or Mao Zedong. But six years into his perhaps indefinite tenure, what has Xi actually accomplished? And where might China be headed under his rule? The same must also be said about China’s military and defense — probably Xi’s No. 2 priority (after strengthening the party) over the past five years. Under the new title of Commander-in-Chief of the armed forces, in January 2016 Xi launched a sweeping reorganisation — the most comprehensive ever — of China’s military and paramilitary forces. The restructuring is but one part of systematic efforts to build a world-class military and, in Xi’s repeated exhortations, to ‘prepare to fight and win wars’. David Shambaugh is the Gaston Sigur Professor of Asian Studies, Political Science and International Affairs at The George Washington University, Washington, DC.This is an adapted version of an article originally published here in Global Asia. Posted in China, China -One Belt One One Road Policy, Foreign Policy, Foriegn Affairs, Geo-Economics, Global Issues, Globalisation, Leadership, Multilateralism, The George Washington University, US-China Relations, www.eastasiaforum.org, Xi Jinping. My Friend, Ambassador John Malott (pic above) is passionate about Cambodia, Japan, Malaysia, Thailand and Vietnam. He lives in Alexandria, Virginia after retiring from a distinguished career as a diplomat with the State Department. In my long distance conversation over to the Internet with my dear friend Ambassador John Malott in Alexandria, Virginia today, we got into a discussion about what we would do with the remainder of our years before we fade, hopefully gracefully, into the sunset. John is 71 and I am 79. I told him that I wanted to realise my childhood dream of being a teacher. After a career in Malaysia’s Foreign Service, Bank Negara Malaysia (Central Bank) and the private sector since 1963, here I am in 2018 not as an ordinary school teacher, but as an academic and researcher at The University of Cambodia (UC). It is without a doubt one of the best decisions I ever made, and that is to be in the company of some of the young and brightest students in Cambodia. Over the last 5 years in Phnom Penh, I am a student again,thanks to Dr. Kao Kim Hourn, UC President, because education is a two way process. I am able to share my life experiences with my students and also learn new skills, share books, exchange ideas with them, and reinvigorate myself. I am lucky, I guess. I am grateful for the opportunity to lead an enriching life of service at UC, and learn from my students about their rich culture, music, history and moral philosophy. Mr. Holland’s Opus is a touching movie about the trials and tribulations of a music teacher who was concerned about his legacy. I too am concerned about my legacy. My American buddy John told me that I should not worry as I have found my calling and passion; and my legacy will be that of a teacher who cares about educating and developing the mind. So here I am a happy and simple man. My liberal business education at The George Washington University was demanding, challenging and morally transformational. Terima kasih (Thanks) GWU for Your Care. Posted in Art and Music, ASEAN, Books, Cambodia, Character and Integrity, Critical Thinking, Education, Ethics, Freedom, Intellectual Development, Liberalism and Open Society, Malaysia, Meritocracy and Competence, The George Washington University, True Grit, University of Cambodia, University of Malaya. Perhaps I should start with a bias warning: I went to a liberal arts university. I teach English literature. I like the liberal arts, whether as a major or part of a broad-based undergraduate education. And I’m dismayed by the recent rhetorical turn in the media, along with legislative and policy initiatives, away from the liberal arts—as if they are suddenly passé or something to be feared your kid will become interested in, like drugs, especially when such expressions are accompanied by statements implying that the liberal arts don’t lead to employable skills. 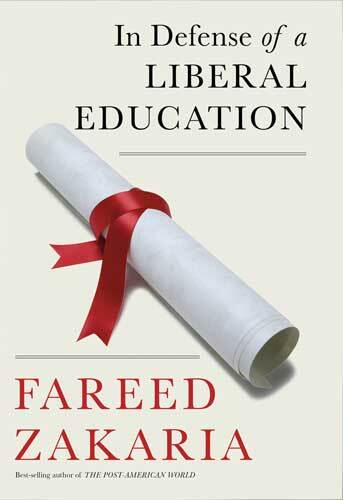 As an antidote, I like to read defenses of liberal education, whether John Henry Newman’s nineteenth century classic The Idea of a University, or articles from current CEOs explaining why they actually prefer to hire liberal arts majors, or statistics that show that the salaries of liberal arts majors stack up favorably against other majors, or books like this latest one by Fareed Zakaria, someone with a real job—if being a public intellectual, editor of Foreign Affairs and of Newsweek and Time, a TV host and commentator, a Washington Post columnist, a college professor, and an influential writer count as having a real job. Thus even before I picked it up, I expected I would like Zakaria’s recent In Defense of a Liberal Education, and I do: but not just because it validates my own views. Actually I disagree with a number of his views and am bothered by some of his analysis, which seems overly glib. But what I especially like about Zakaria’s modest book is that it isn’t simply another jeremiad about the ills of American higher education, nor an uninformed call for radical changes which too often tend to throw the proverbial baby out with the bathwater, nor an ideological rant with more ideology than information. Instead, it’s a welcome call for balance, written with balance: balancing data, personal stories, social policy, and an understanding of the history of liberal education in America and the multiple purposes of higher education, all accomplished in the context of Zakaria’s deep knowledge of the present social and political global landscape. Zakaria’s response is this book. It is actually a collection of six essays (the six chapters of the book) with a fairly broad focus. But what ties the chapters together is Zakaria’s personal story and his ongoing ethical authority on the subject: as someone who draws daily on his liberal education and the life skills it imparted. Chapter One, “Coming to America,” tells Zakaria’s personal story, of being raised in India in its education system focused on memorization, content, and tests (steering children, boys especially, almost exclusively into science and business), then almost on a lark finding himself applying to and getting into Yale in the 1980s (when liberal arts institutions in the U.S. were barely on the radar of Indians). 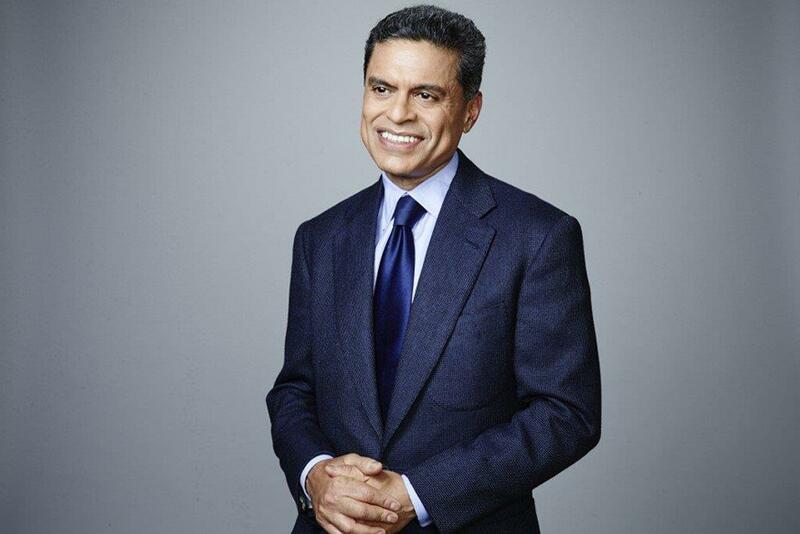 Zakaria then tells how at Yale he discovered the power of a liberal education and through it also discovered his future path in international politics and economics, majoring in history (subsequently earning a PhD in Government from Harvard). What makes the story powerful and contemporary is that it’s a version of the classic “American” story, in its Global 2.0 incarnation, of an individual making good through hard work, determination, and exposure to the American system of higher education. And the story itself is a necessary reminder to policymakers now, appropriately worried about American global competitiveness and statistics showing us falling behind in the educational attainment of our population. And the moral of the story is that our education system, with all its problems, is still the envy of the world. And still producing remarkable results. Chapter Two, “A Brief History of Liberal Education,” though brief, covers a two thousand year history, starting with the Greeks, dashing through the establishment of medieval universities, with a glance at Britain, to an examination of the American system, with a focus on Harvard’s curricular innovations, the rise of electives, and the emergence of our standard liberal arts curricula—with a core curriculum, a major, and a healthy dose of exploration and free choice. Zakaria’s theme throughout is that societies have always struggled with balancing competing needs in their education systems, that curricula in this country have always been undergoing changes, that they aren’t frozen in the medieval past (which some critics continue to claim). Nevertheless, Zakaria recognizes that improvements still need to be made: especially in increasing the scientific literacy of all students. Zakaria again offers a personal example of change, of Yale’s recent joint venture (where Zakaria had become a trustee) with the National University of Singapore to establish a new liberal arts institution in Asia, Yale-NUS College, which opened its doors Fall 2013. Recognizing Singapore’s own need to develop more of the kinds of creativity and critical thinking and entrepreneurship characteristic of American higher education—and even more of the self discovery—it has made a recent bet on more liberal education, not less. The value of this Chapter 2 actually lies in its brevity. It isn’t that the history Zakaria tells here is new, and it is developed in far less detail than in the sources that Zakaria draws upon (carefully citing the sources in this first book since his own citation scandal in 2012 that we have seen affect other public intellectuals similarly writing at speed with research staffs, and therefore sometimes not as careful about citations as the standards of academic research require). But overviews have their role as well. And many current skeptics or other busy people paying only occasional attention to higher education debates aren’t going to take the time to read the comprehensive histories of the liberal arts (such as Wesleyan’s president, Michael Roth’s 2014 erudite Beyond the University: Why Liberal Education Matters, which Zakaria also cites). So there is value in quickly retelling the story, reminding us of how we got here, and reminding us what the liberal in liberal education means, which seems especially important for those made queasy by having any association with a term that also serves as a political label as well (Zakaria’s own political views have been variously characterized as centrist, moderate, liberal, and/or conservative). In this case, Zakaria reminds readers that the liberal in liberal education has its roots in a two thousand year history of liberation and freedom—and not in 21st century American politics. Chapter 4, “The Natural Aristocracy,” is an eclectic chapter continuing Zakaria’s theme of meritocracy and capitalism as effective and necessary backdrops for our education system (he takes the term natural aristocracy from Thomas Jefferson, indicating a meritocratic system based on talent rather than birth, wealth, and privilege). And he starts with a meditation on the founding fathers and especially on Ben Franklin as the poster child for the American system. Interestingly, this is also the chapter where Zakaria addresses some of the problems bedeviling higher education, including costs that continue to outpace inflation and the continued cost shifting from public sources to individuals, leading to increased individual debt. Zakaria doesn’t have a single solution to offer, but—experienced in the power of mass media to reach all parts of the globe as he is—he, like many others, is fascinated by the promises of technology and distance delivery of courses, especially MOOCs (still new enough to require an identification of the acronym: Massive Open Online Courses). Still in their infancy, they already are expanding access to information, to great teachers, and to American liberal education. One thing Zakaria finds interesting about MOOCs is that students worldwide aren’t just seeking out engineering and technical courses in this online environment; they are also interested in the liberal arts. Chapters 5 and 6, “Knowledge and Power,” and “In Defense of Today’s Youth,” turn to even broader subjects, though are each short chapters. Chapter 5 addresses the power of knowledge to change the world, and Chapter 6 is Zakaria’s attempt to address the value of a liberal education in developing the individual life of the mind and ourselves as human beings. Though worthy subjects, both read a bit more like newspaper columns than book chapters at this point—and it’s not surprising that the most frequently referenced source in these latter chapters is New York Times columnist David Brooks, whom Zakaria sees himself in dialogue with here. Ultimately, it is dialogue that Zakaria wants to promote with this book—informed dialogue. And his method of provoking it is to provide a “zoomed out” Google Earth view of American higher education, which—to keep the map metaphor going a bit—functions as a kind of Mercator projection with the importance of liberal education at the center. And as such, it is successful, bearing the strengths and weaknesses of such an intent. It makes effective use of Zakaria’s compelling success story, making his story emblematic of our times; it provides a good overview of issues in higher education; it provides a useful survey of many recent good books on the same subject (from Andrew Delbanco’s College: What It Was, Is, and Should Be (2012), to Academically Adrift: Limited Learning on College Campuses (2010), and Excellent Sheep (2014)—all previously reviewed in Montana Professor, the latter in this issue); it’s written in a breezy, quick-reading journalistic prose, and it provides much concrete data to counter the recent public narrative that we’ve outgrown or can no longer afford our childish preoccupation with liberal education. As for its weaknesses, like an unfocused essay, perhaps, the book tries to do too much, thereby having to cover territory too quickly, occasionally relying on too many generalizations in the meantime. As such, it’s not always possible to tell what the generalizations mean (e.g., “Bill Gates was one of the first larger-than-life private figures in contemporary America”). Also, like many books on higher education, there’s a tendency to focus on and continue our culture’s obsession with our so called “elite” or “best schools” when much of the information is actually relevant to the whole education infrastructure—including the Montana University System. And sometimes Zakaria wraps up a survey of complex issues with a simple question as a conclusion, such as “Is this so bad?” That method, however, is a good indication of the purpose of the book. Its focus is on common sense, from someone with an uncommon biography, who is criticizing what is becoming too common: taking for granted the importance of a liberal education in this country that not only can we afford, but that we can’t afford to do without. Posted in Book Review, Books, Creativity and Innovation, Critical Thinking, Democracy, Education, Fareed Zakaria, Freedom, Intellectual Development, Knowledge, Liberalism and Open Society, Philosophy, The George Washington University, Thinking. Universities pride themselves on producing creative ideas that disrupt the rest of society, yet higher-education teaching techniques continue to evolve at a glacial pace. Given education’s centrality to raising productivity, shouldn’t efforts to reinvigorate today’s sclerotic Western economies focus on how to reinvent higher education? CAMBRIDGE – In the early 1990s, at the dawn of the Internet era, an explosion in academic productivity seemed to be around the corner. But the corner never appeared. Instead, teaching techniques at colleges and universities, which pride themselves on spewing out creative ideas that disrupt the rest of society, have continued to evolve at a glacial pace. Sure, PowerPoint presentations have displaced chalkboards, enrollments in “massive open online courses” often exceed 100,000 (though the number of engaged students tends to be much smaller), and “flipped classrooms” replace homework with watching taped lectures, while class time is spent discussing homework exercises. But, given education’s centrality to raising productivity, shouldn’t efforts to reinvigorate today’s sclerotic Western economies focus on how to reinvent higher education? One can understand why change is slow to take root at the primary and secondary school level, where the social and political obstacles are massive. But colleges and universities have far more capacity to experiment; indeed, in many ways, that is their raison d’être. For example, what sense does it make for each college in the United States to offer its own highly idiosyncratic lectures on core topics like freshman calculus, economics, and US history, often with classes of 500 students or more? Sometimes these giant classes are great, but anyone who has gone to college can tell you that is not the norm. At least for large-scale introductory courses, why not let students everywhere watch highly produced recordings by the world’s best professors and lecturers, much as we do with music, sports, and entertainment? This does not mean a one-size-fits-all scenario: there could be a competitive market, as there already is for textbooks, with perhaps a dozen people dominating much of the market. And videos could be used in modules, so a school could choose to use, say, one package to teach the first part of a course, and a completely different package to teach the second part. Professors could still mix in live lectures on their favorite topics, but as a treat, not as a boring routine. A shift to recorded lectures is only one example. The potential for developing specialized software and apps to advance higher education is endless. There is already some experimentation with using software to help understand individual students’ challenges and deficiencies in ways that guide teachers on how to give the most constructive feedback. But so far, such initiatives are very limited. Yes, outside of traditional brick-and-mortar universities, there has been some remarkable innovation. The Khan Academy has produced a treasure trove of lectures on a variety of topics, and it is particularly strong in teaching basic mathematics. Although the main target audience is advanced high school students, there is a lot of material that college students (or anyone) would find useful. 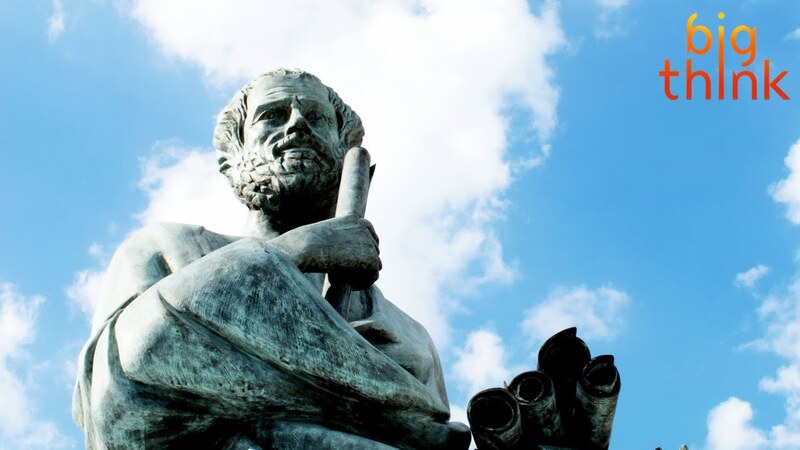 Moreover, there are some great websites, including Crash Course and Ted-Ed, that contain short general education videos on a huge variety of subjects, from philosophy to biology to history. But while a small number of innovative professors are using such methods to reinvent their courses, the tremendous resistance they face from other faculty holds down the size of the market and makes it hard to justify the investments needed to produce more rapid change. Let’s face it, college faculty are no keener to see technology cut into their jobs than any other group. And, unlike most factory workers, university faculty members have enormous power over the administration. Any university president that tries to run roughshod over them will usually lose her job long before any faculty member does. Of course, change will eventually come, and when it does, the potential effect on economic growth and social welfare will be enormous. It is difficult to suggest an exact monetary figure, because, like many things in the modern tech world, money spent on education does not capture the full social impact. But even the most conservative estimates suggest the vast potential. In the US, tertiary education accounts for over 2.5% of GDP (roughly $500 billion), and yet much of this is spent quite inefficiently. The real cost, though, is not the squandered tax money, but the fact that today’s youth could be learning so much more than they do. Universities and colleges are pivotal to the future of our societies. But, given impressive and ongoing advances in technology and artificial intelligence, it is hard to see how they can continue playing this role without reinventing themselves over the next two decades. Education innovation will disrupt academic employment, but the benefits to jobs everywhere else could be enormous. If there were more disruption within the ivory tower, economies just might become more resilient to disruption outside it. Posted in Creativity and Innovation, Education, Globalisation, Governance, Intellectual Development, Leadership, Meritocracy and Competence, Political Economy, Project-Syndicate.org, Public Policy, Science, Technology, The George Washington University, WEF@Davos. Sen. Duckworth, Lt. Gen. Nadja Y. 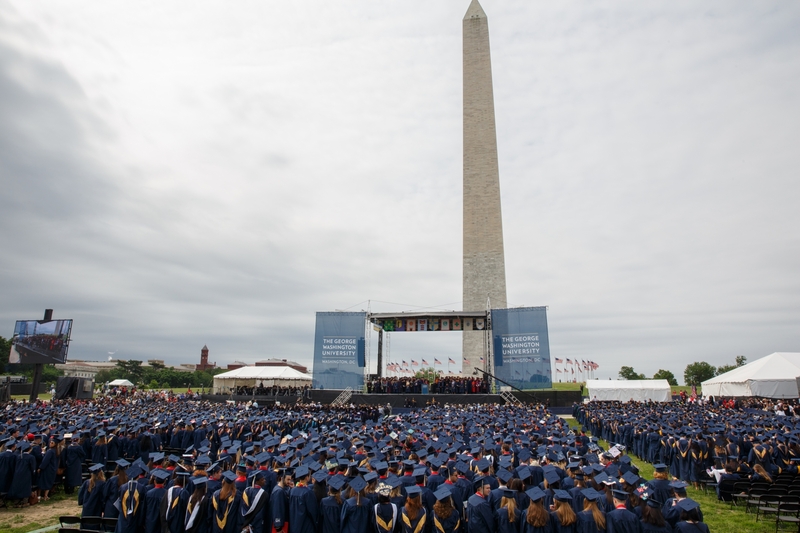 West and The Washington Post Executive Editor Martin Baron received honorary degrees as 6,000 students graduated from GW. U.S. Sen. Tammy Duckworth (D-Ill.) described Nov. 12, 2004, as her “alive day” during her George Washington University Commencement address Sunday on the National Mall. Flying over Iraq, Sen. Duckworth’s Black Hawk helicopter was hit by a rocket-propelled grenade. The explosion vaporized one of her legs, she said, and blew off the back of her right arm. The aircraft instrumental panel amputated her other leg. “I was quite literally in pieces,” Sen. Duckworth said. Yet, her crew refused to leave her behind, she said, and helped to save her life. “I knew from that moment on I would spend every single day of the rest of my life trying to honor the courage and sacrifice of my buddies who saved me,” Sen. Duckworth told an estimated crowd of 25,000, including roughly 6,000 graduates, as the university celebrated the end of its 196th academic year. The senator shared her personal story as part of her themes of embracing failure, taking advantage of opportunity and maintaining humility in which she referenced the words of President Theodore Roosevelt and rapper and songwriter Kendrick Lamar. “Every time I got knocked down, I got back up. I dusted myself off, and I got back in the arena—when my face had literally been marred with dust and sweat and blood. And I am so glad that I did,” she said. But doing so, Sen. Duckworth said, requires trying, doing, putting yourself out there and—yes—sometimes failing. 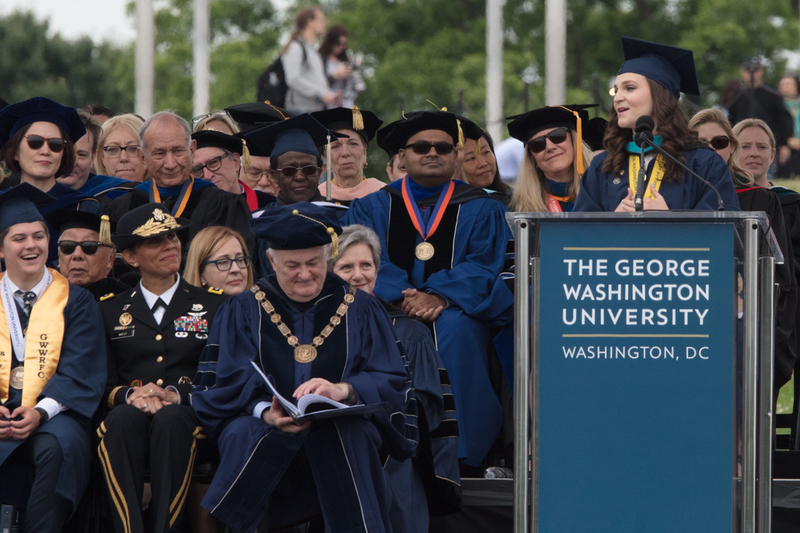 And she urged graduates to remember the “good fortune and luck” they had that enabled them to experience the opportunities and take advantage of the resources at GW. Sen. Duckworth urged students not to lose sight of what lays ahead, what remains to be accomplished. Remarks from university leaders preceded Sen. Duckworth’s Commencement address. Provost Forrest Maltzman welcomed graduates, highlighting the “one-of-a-kind” opportunity to celebrate Commencement on the National Mall. GW is the only university that holds its graduation ceremony on the Mall. Introducing George Washington President Steven Knapp, Dr. Maltzman thanked Dr. Knapp, whose tenure as president ends July 31 after 10 years of service to the university. He noted how the university has advanced under his leadership. “I know that what he is proudest of is the approximately 50,000 students who have graduated from this university during his tenure and who are each making their own contributions to the world,” Dr. Maltzman said. Dr. Knapp continued “an important Commencement tradition” by thanking the parents, families and friends of the graduates. Mr. Carbonell also took a moment to recognize Dr. Knapp—not only for the institution’s growth under his leadership but also for his direct involvement in students’ success, from move-in day to Commencement. “President Knapp wants all of you to succeed in your future endeavors,” Mr. Carbonell said. Angela Sako, B.A. ’15, M.P.P. ’17, was selected as this year’s student speaker. Her remarks Sunday were framed around life’s “welcomes”—the “welcomes” that many receive to uncertainty, challenges, new friends or a new university. But with support from family and friends, she said she transformed grief into resilience. She eventually was welcomed to GW with a letter of acceptance and a Stephen Joel Trachtenberg Scholarship. She encouraged her fellow graduates to welcome the years ahead. “Our journey ahead might hand us some bricks, but let us remember that if we welcome these challenges, and we encourage each other to open a window, a wide door will follow,” Ms. Sako said. Dr. Maltzman also recognized this year’s recipients of the GW Awards, presented to students, faculty and staff who have made extraordinary contributions to the GW community. Richard Livingstone, B.A. ’12, M.P.A. ’17; C. Thomas Long, Ph.D. ’05, assistant professor of history and coordinator of undergraduate history advising; and Bridget Smith, B.A. ’17, were recognized with the awards Sunday. Three other students—Howard Charles Goodison II, B.A. ’17; Antonia Keutzer, B.S. ’17; and Thomas Elms, B.A. ’17—assisted Dr. Knapp in conferring honorary degrees Sunday to Sen. Duckworth, Lt. Gen. Nadja Y. West, M.D. ’88, and The Washington Post Executive Editor Martin Baron. Dr. Knapp highlighted the recipients’ many achievements and officially awarded each with an honorary degree of doctor of public service. In his remarks, Mr. Baron talked about the importance of a free press as journalists face growing threats both around the world and in the United States. “The president has said that he is at war with the media,” he said. “We are not at war. We are at work. Later, finally, GW’s most important degree recipients of the day got their turns. 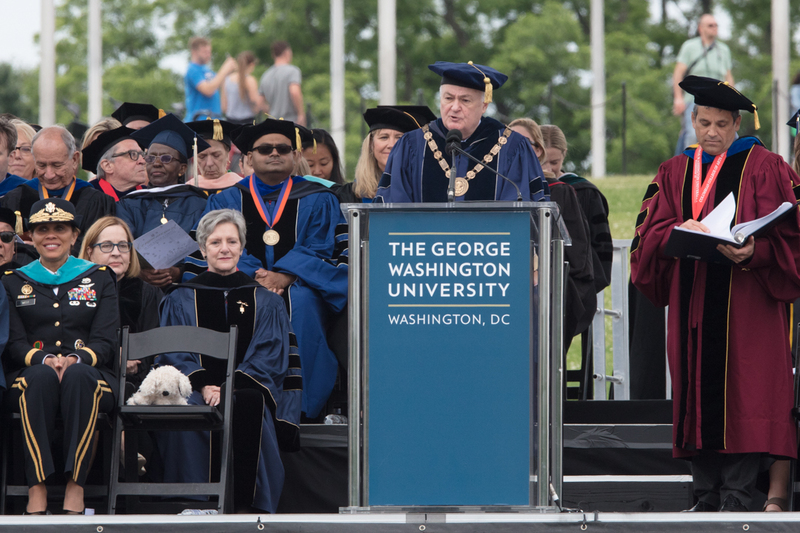 The graduates joined a “lifelong and worldwide community” of GW alumni, now numbering more than 280,000, Dr. Knapp said. Dr. Knapp charged them to keep alive their spirit, energy, imagination, commitment to service and curiosity. “You are our future,” Dr. Knapp said. “We depend on you to repair what earlier generations have broken, to build what we have left un-built, to learn what we have not yet learned, to heal what we have so far left unhealed. Posted in Democracy, Donald J Trump, Education, Freedom, History, Knowledge, Leadership, Political Philosophy, The George Washington University. The George Washington University has evolved into one of the nation’s leading universities. To continue advancing, the university has produced Vision 2021, an educational vision that reflects our aspirations to provide a unique, rigorous education to every one of our students and to secure our position as one of the world’s premier research universities. Scholarships will contribute to two years of college tuition in exchange for teaching after graduation. A new program at the George Washington University will offer science, technology, engineering and mathematics majors the opportunity to receive teacher training and scholarships for agreeing to teach in high-need school districts across the country after graduation from GW. The new initiative is made possible by a grant through the National Science Foundation and the Robert Noyce Teacher Scholarship Program. The five-year, $1.5 million grant will begin at the start of the 2017-18 academic year and is expected to assist more than 25 students total with $20,000 per year toward the cost of tuition and teacher training in their junior and senior years. Once students complete the GWNoyce program, they will be prepared to apply for licensure with the D.C. public school system, which would make them eligible to teach in 48 states. Dr. Medsker said the program will be particularly strong because it will recruit students who are already studying STEM-based fields and offer them courses, workshops, seminars and service projects to prepare them to be teachers in high-need schools. It also will offer preparatory stipends and projects for freshmen and sophomores who are interested in applying to the program, in conjunction with activities offered by the Honey W. Nashman Center for Civic Engagement and Public Service, GWTeach, a separate GW undergraduate program that prepares STEM majors to become teachers, and a new partnership between GWTeach and the Smithsonian Science Education Center. Because of these additional offerings, the program is expected to reach more than 500 GW students by 2022. Posted in civil society issues, Education, Global Issues, Governance, History, Holistic and Balanced Development, Leadership, Public Service, Social Studies, The George Washington University.